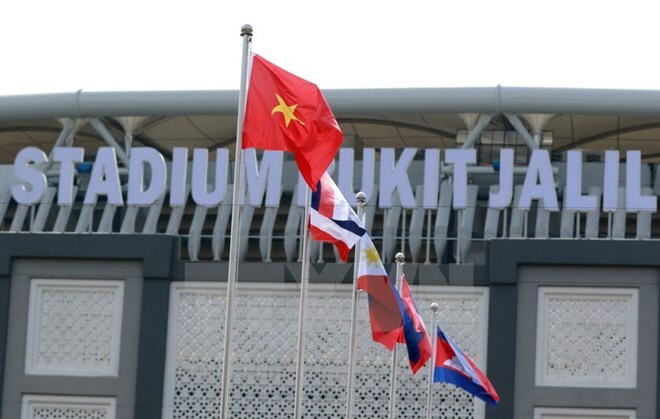 Kuala Lumpur (VNA) – A Vietnamese delegation to the 29th Southeast Asia Games (SEA Games 29) took part in a flag-hoisting ceremony held at Bukit Jalil National Stadium in Kuala Lumpur, Malaysia on August 16. The ceremony officially marks the presence of Vietnamese competitors at the region’s largest sport events. More than 470 Vietnamese athletes are ready to compete in 32 out of 38 sports events, including four paid games of bowling, hockey, cricket and synchronised swimming. According to Deputy Director of the General Department of Sports and Physical Training Tran Duc Phan, who is head of Vietnam’s SEA Games delegation, the Vietnamese athletes will strive to pocket 49-59 gold medals to rank in the top group at the biennial event. The delegation will also make utmost efforts to effectively perform the role as a goodwill ambassador of Vietnam to the people of Southeast Asian countries, Phan added.